Longtime School of Aerospace Engineering professor Panagiotis Tsiotras has been elected as a Fellow of the Institute of Electrical and Electronics Engineers (IEEE), one of the world's leading professional associations for advancing technology “for contributions to nonlinear control of aerospace systems”. Tsiotras holds a Dean’s Professorship in the Daniel Guggenheim School of Aerospace Engineering and is the associate director of Georgia Tech's Institute for Robotics and Intelligent Machines (IRIM). 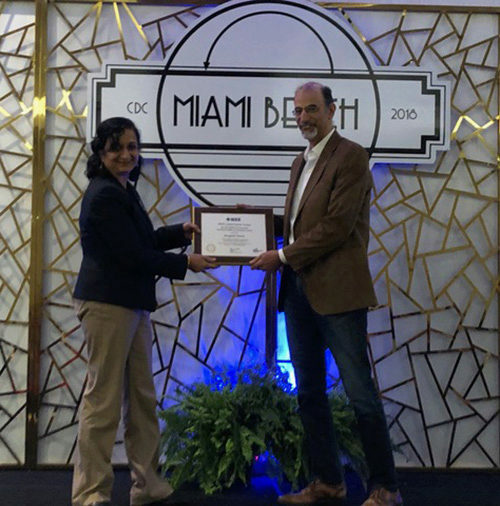 Prof. Panagiotis Tsiotras officially received the IEEE Control Systems Society's 2018 Award for Technical Excellence in Aerospace Control during the 2018 IEEE Conference of Decision and Control, held Dec. 18 in Miami, Florida. That award annually recognizes recipients for "outstanding contributions in control theory and transitions to aerospace applications." Fewer than .01 percent of the IEEE's voting members are selected as Fellows, which is highest level of recognition given by the organization. Tsiotras previously held the title of Senior IEEE Member. 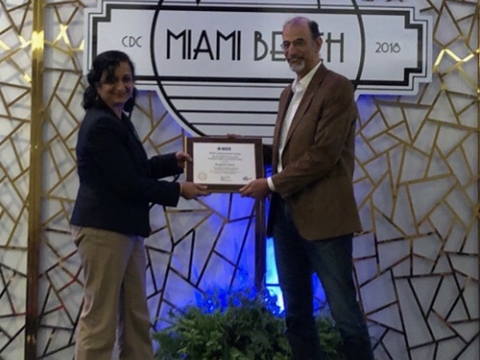 "This is certainly a well-deserved honor for Dr. Tsiotras and a wise choice for IEEE," said Mark F. Costello, the William R. T. Oakes Chair of the AE School. "We've always looked to Panos to push the boundaries of control research, and he's never disappointed us." Earlier in the fall, IEEE tapped Tsiotras for another honor: the Control Systems Society's 2018 Award for Technical Excellence in Aerospace Control. (see box). Already a Fellow of the American Institute of Aeronautics and Astronautics (AIAA), Tsiotras heads up the AE School's Dynamics and Control Systems laboratory (DCSL) where he directs both undergraduates and graduates in the theoretical and experimental investigation of highly complex, and uncertain aerospace and electromechanical systems. Tsiotras's research interests include nonlinear and optimal control and their connections with artificial intelligence (AI), emphasizing autonomous and semi-autonomous ground, aerial, and space vehicles applications. Tsiotras is also a recipient of the NSF CAREER award, the Outstanding Aerospace Engineer Award from Purdue, the Sigma Xi President and Visitor's Award for Excellence in Research, as well as numerous other fellowships and scholarships. He is currently the chief editor of Frontier in Robotics & AI in the area of space robotics. With more than 400,000 members in 160 countries, the IEEE is widely considered a leading authority on a variety of areas ranging from aerospace systems, computers and telecommunications to biomedical engineering, electric power and consumer electronics.